U-Reach Data Solutions Inc.: What is the importance of a HDD Event Log Function? How does iSecuLog works? What is the importance of a HDD Event Log Function? How does iSecuLog works? What is the importance of a HDD Event Log Function? Government and University officials are required to comply with external regulations, internal policies and security practices. They acknowledge that many business or IT department will be monitoring user access to any systems and applications. Therefore, an HDD Event Log is needed. U-Reach Hard Drive duplicator solution has this function built into the system on a hardware level by connecting to PC Link software in Real-Time. You can easily collect and analyze work status, execute time, HDD info, drive capacity, model, S/N, and Transfer Speed and is protected by U-Reach’s iSecuLog (Anti-Tampering Event Log Report). 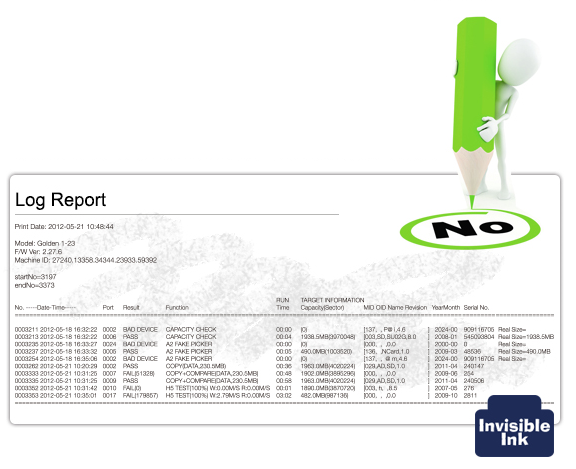 A unique “Invisible Ink” applied onto the text file report. This protection will ensure the Event Log integrity with 100% accurate yield rate analysis. Without this type of technology, log report is easily tampered by anyone who reads and delivers it. In all environment scenario, this reduces complexity of Event Log, save time and cost, improves information assurance and compliance reporting.